Redemption, thy name is Flower. Going into the first game of the 2013 NHL season, many of us were hesitant to place all of our faith into the glove of our 28 year old netminder Marc-Andre Fleury. Considering the way he ended his stint in the 2012-2013 Postseason, many of these doubts were not completely unfounded. During the five games he played in the early stages of the Penguin's playoff run last season, Marc let in 17 goals and posted a .883 Save Percentage, less than stellar for any Goalie with Stanley Cup aspirations. This fall from grace led to the heroic emergence of Tomas Vokoun and Fleury's subsequent trip to seek the professional help of a Sports Psychologist, not to mention leading many of his faithful fans to either self-medicate or seek a little professional help of their own. The Playoffs came and went, and another disappointing chapter in Penguins History was on the books. Going into this season we who ardently support the Black and Vegas Gold had many questions indeed. One thing widely believed however, was that Tomas Vokoun was not going to be our #1 in net. A solid veteran presence sure, but at his advanced sporting age of 37 nobody was under the impression that he could carry the burden left by an unsure Marc-Andre Fleury for the extent of an entire season. It was not long before the first Hockey Night in Pittsburgh, that we learned of the unfortunate blood-clot issues plauging Vokoun. With the health of the Czech netminder being the number one priority, Tomas was ruled out indefinately pending the discontinued need for blood thinners. This means that with Jeff Zatkoff as our backup, and no cap space left to sign a veteran, the pressure to preform landed back squarely on the shoulders of Number Twenty-Nine. ... And roll he did. One game into the new season, it looks as though Flower is up to his old tricks again... The good ones, the ones we all know he is fully capable of. 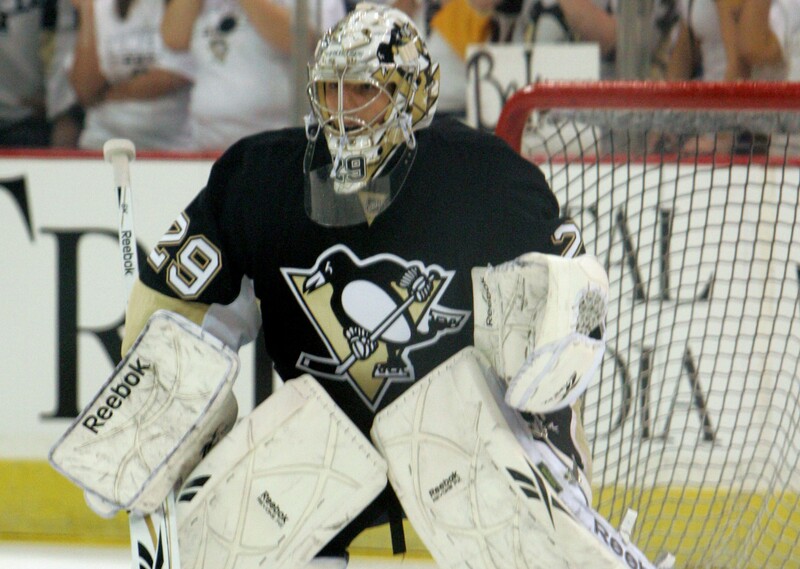 Fleury came out of his first game of the young season looking as strong as ever. Turning away every single one of the 27 shots thrown at him, and not without taking our breath away with an incredible grab of a puck rolling down the numbers on his back. All said and done, and after sixty minutes had passed at Consol Energy Center, Marc-Andre Fleury had his 250th NHL victory in goal under his belt. There's really not much more one could ask of a goalie early in the season then posting a 3-0 shutout of a division foe. If game one is any indication, we should be in for an interesting season. Let's just hope "The Flower" continues to bloom. 1-0 through One. Let's Go Pens!